Week one of the playoffs was a challenge for the West Linn football team. Week two had its moments as well. But now, in the Class 6A state quarterfinals, the Lions will find out what they're really made of. 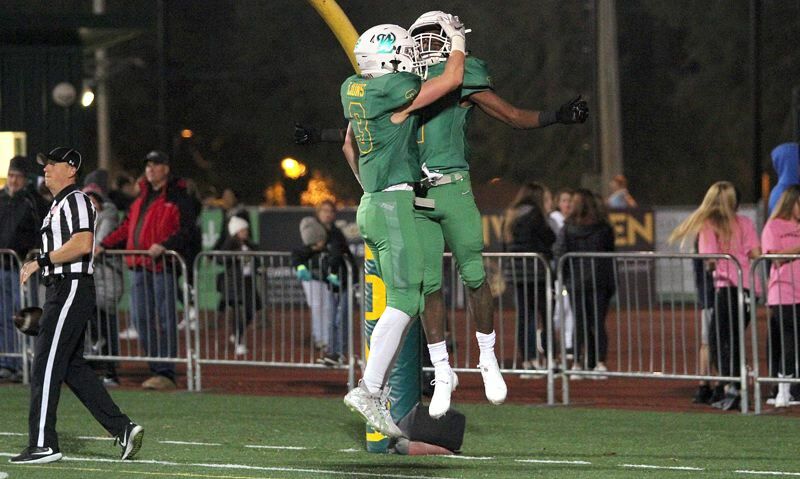 At 7 p.m. Friday, West Linn will face one of the state's marquee programs — No. 3 Sheldon — at Sheldon High School with a state semifinal berth on the line. The Irish enter the contest on a five-game winning streak and carrying a 9-2 overall record after winning the Southwest Conference title. The Lions, meanwhile, are sixth ranked, enter as winners of three straight games and carry an 8-3 record after tying for third in the Three Rivers League. The matchup also serves as a rematch for the two teams — the Irish beat the Lions 42-27 at Sheldon High School back on Sept. 14. "Ethan Long got (injured the first time we played) so we're excited to go back down there again and see what's up," said West Linn senior running back Dawson Jolley. "Sheldon is a good football club, we're a good football club, but we're are ascending now at the right time," said Long, a senior quarterback. "Our offense and defense are just playing strong." Thus far in the playoffs, the Irish have already beaten 30th-ranked Centennial 42-6 and No. 14 Sherwood 44-28, while the Lions have knocked off No. 27 McMinnville 70-35 and No. 11 Lakeridge 55-20. Sheldon's offense is led by eight first-team all-Southwest Conference selections, including junior center Andy Adams (6-foot-2, 295 pounds), junior guard Seth Meier (6-0, 270), junior tackle Taylor Johnson (6-4, 255), senior tight end Patrick Herbert (6-5, 235), senior running back Matthew Burgess (5-11, 195), senior receiver Zach Folsom (5-10, 185), senior quarterback Michael Johnson Jr. (6-4, 205) and sophomore placekicker Jay Kartub (5-10, 160). Johnson has thrown for 1,479 yards and 17 touchdowns with just two interceptions while completing 58 percent of his passes. He's also run for 1,008 yards and 14 TDs on 107 carries. Burgess leads Sheldon rushers with 1,262 yards and 20 touchdowns on 135 carries. Herbert is the team's top receiver with 35 catches for 649 yards and 11 TDs. Second-teamers on the Irish offense include junior guard Max Meirer (6-0, 255), senior tackle Madden Salisbury (6-3, 320) and junior running back Lane Shields (6-2, 215). "If we limit turnovers, honestly, I think we're better than any team in the state," said West Linn junior wide receiver/defensive back Casey Tawa. "If we limit turnovers, the defense plays strong, eliminates the QB run, that takes care of everything." "Our defense is doing a great job," Long said. "It's so helpful when, if we don't have a great drive, they're just playing so awesome." On their side of the football, the Lions have a ton of their own offensive weapons ready to deploy, led by first- and second-team all-TRL picks including: Long (6-3, 215) — he's thrown for 3,009 yards and 31 touchdowns with 15 interceptions while completing 64 percent of his throws (he also has 345 rushing yards and eight TDs); Jolley (5-11, 173) has piled up 1,395 yards and 19 TDs on 161 carries; senior wide receiver Cade Knutson (6-3, 191) — he's made 55 catches for 897 yards and 10 TDs; Tawa (6-0, 172) — he's made 60 catches for 873 yards and eight scores; junior center Ryan Seth (6-0, 285); senior tackle Brian MacClanathan (6-1, 232); and senior guard Zach Ashcraft (6-2, 281). Both teams are stacked defensively, too, the Irish led by first-team all-SWC picks Austin Lasby (a 6-2, 330 senior lineman), Parker Wiles (a 6-0, 220 senior linebacker), Jack Folsom (a 5-11, 175 senior defensive back) and Herbert at punter. Honored as second-team selections for Sheldon were: Salisbury and senior Isaiah Lugo (5-11, 225) on the line; junior linebacker Ben Mehlhaff (6-2, 200); and senior defensive backs Jacob Frey (6-2, 185) and Calin Morgan (5-10, 160). For West Linn's defense, leaders include first-team all-TRL picks Seth on the line, MacClanathan at linebacker, senior linebacker Elijah Ntsasa (6-1, 195), Tawa at cornerback, and senior Max Jacobs (5-11, 181) at safety. Jolley also earned second-team honors at cornerback. So what will be the key to victory? "Taking care of the ball," Jolley said. "We've got the weapons, we've got the line, we've got the defense — we've just got to take care of the ball and keep healthy." "Our offense and defense are just playing strong, but we have to play our best game," Long said. "It's going to be who makes the least mistakes."